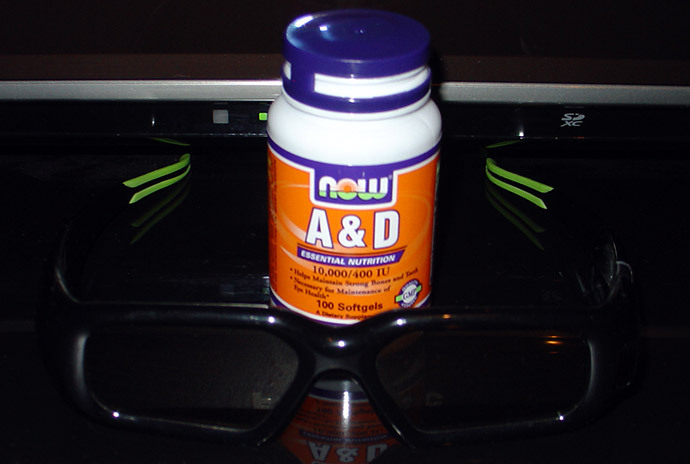 There are two food supplements that are very important for the proper eye functioning and may help when talking about watching stereo 3D content without issues, these are Vitamin A and Litein. The lack of these two things in your daily diet can lead to reduced vision, light sensitivity and so on, however you should also be careful not to take too much additional Vitamin A, as there might be some side effects. So it is bet to consult with your doctor before starting to take additional food supplements in the form of Vitamin A and Lutein. Vitamin A is needed by the retina of the eye in the form of a specific metabolite, the light-absorbing molecule retinal, that is absolutely necessary for both low-light and color vision. Deficiency of vitamin A, due to the unique function of retinal as a visual chromophore, can lead to the appearance of problems such as impaired vision, particularly in reduced light also called night blindness. Excessive vitamin A consumption can however lead to nausea, irritability, anorexia (reduced appetite), vomiting, blurry vision, headaches, hair loss, muscle and abdominal pain and weakness, drowsiness, and altered mental status. Lutein as a food supplement is another thing that is important for proper eye function and additional protection. Lutein was found to be concentrated in the macula, a small area of the retina responsible for central vision. Studies suggest that intake of Lutein can decreases the risk for eye diseases such as Age-related Macular Degeneration as well as bring improvement in visual performance and decrease in glare sensitivity. While no recommended daily allowance currently exists for Lutein, positive effects have been seen at dietary intake levels of 6–10 mg/day. The only definitive side effect of excess Lutein consumption is bronzing of the skin. It is important to keep your eyes healthy and in good condition, so do have in mind the information above as a reference and something to think about at least, but do not do stupid things taking food supplements before consulting with a doctor! If you are having trouble perceiving stereoscopic 3D content, getting headaches or any other trouble it is a good idea to visit a specialist and do a check up of your eyes, it is quite often that the reason are issues with your own vision and not with the 3D content itself! Or how about eating healthy and stop using those pills which is untested for the long term and full of side effects? our body does not absorb those pills very well and the portions are too high in a short time compared to natural food but marketing and business will always try to sell those pills to you. Natural food is healthy, no side effects, make us look better shape wise and taste good, less cheeseburger and more fruits please ! This article is a lot of BS. You seriously expect people to believe that vitamin supliments are necessary for 3D.. or that they should even be considered for this purpose. For general eye health MAYBE (although it’s only be necessary if you subside on a less than healthy diet).. but to try to link it to 3D use as well??? I second the idea of promoting diet awareness as a means to better 3d vision. Eating well should definitely be a priority in achieving maximum performance from our most important piece of hardware, our own body. One issue I find worth adding is that supplements should always be treated as excactly what it means, “supplementary to regular food”. Keeping a diet containing minimally refined food seems to keep at least my health at an optimal state of perceiving and enduring 3d imagery.